DAVID LE/Staff photo. 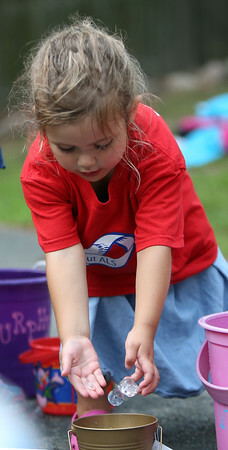 Two-year-old Addie Mayo drops some ice cubes into her small bucket as she prepared to take the Ice Bucket Challenge on Saturday evening. The neighborhood around Pete's Park in Centerville all took part in the Ice Bucket Challenge in honor of Pete Frates, who attended the gathering on Saturday evening. 8/15/15.